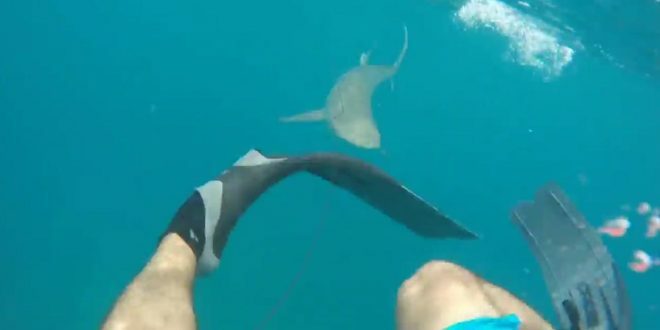 A stand-up paddle boarder is in the hospital after being bitten by a shark Saturday morning in Kona waters. The 25-year-old man is reportedly in critical condition. Sources say he lost at least one limb. The incident happened around 9:30 a.m. He was stand up paddle boarding around 100 to 150 yards off Kukio Beach when it happened. “The information that we are receiving is that he was brought to shore immediately and was helecoptered over to the hospital and is receiving medical attention there and all ocean access is currently closed under recommendation of the Hawaii fire department,” Morgan Suzuki, director of public relations and communications for the Four Seasons Resort Hualalai said. Big Island officials say the man suffered injuries to his hand and leg. Signs warning ocean goers of the shark hazard are posted within a one mile distance from the incident. Signs will remain posted until ocean safety officials give the all clear. They will assess conditions Sunday morning.